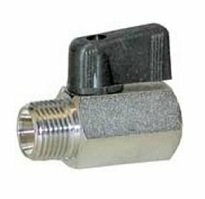 1/4" Shut-Off Ball Valve, Male x Female ON SALE NOW! Buy one QD40 and one QD80, get one JD-IC-3354 Ball Valve FREE. Use promo code FREEVALVEQ2 at check out. Valid through the end of June 2019. 1/4" Ball Valve Shutoff ¼" FPT x ¼" MPT Engineered to handle thousands of hours of heavy duty use! Carpet Cleaner Solution line shut off valve.